Honey bees evolved as consumers of food from flowers. Honey bees forage nectar from flowers to produce honey, the high-energy food they store to eat during the dearth of winter. Actually, they will forage from any available source of carbohydrate. The source may be flowers in bloom, or unprotected honey in another bee hive. Foraging worker bees learn to rob other bee hives, especially during times of dearth when little nectar is available from blooming flowers. Each honey bee colony protects its honey stores by stationing guard bees at the hive entrance to detect and turn away bees from other colonies. Robber honey bees attempt to fight their way past guard bees to get to stores of honey to carry back to their own hives. As the robber bees tangle with guard bees, they lose some of their body hair; thus robbers appear black and shiny. Robbing often occurs in late summer and early fall; it can be especially troublesome to beekeepers during the honey harvest. If the beekeeper leaves hives open for too long or leaves honey supers exposed, robbing can start suddenly. When this happens, the air becomes filled with bees. 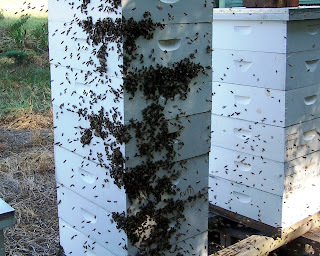 Open hives or exposed honey supers become covered with bees. When robbing occurs during beekeeping operations, action should be taken to quell the frenzied bee activity. Reducing the hive entrances gives the guard bees an advantage over robber bees attempting to enter the hive, because the defenders have less area to guard. Today’s photo shows a bee hive under attack by robber bees. I helped this colony’s guards regain control by placing a brick on the landing board to reduce the hive entrance. Following the robbing incident, dead bees littered the ground. Robbing probably occurs more frequently in managed bee yards than in nature. Honey bees do not tend to nest in great numbers of colonies in close proximity. Beekeepers use the bees’ robbing behavior to clean the honey residue from extracted frames after the harvest. One day after publication of my letter to the editor of Memphis’ The Commercial Appeal, I have heard a number of comments about my suggestion that we consider a highway right-of-way management plan involving plantings of native wildflowers and grasses. The comments have been thoughtful and supportive. 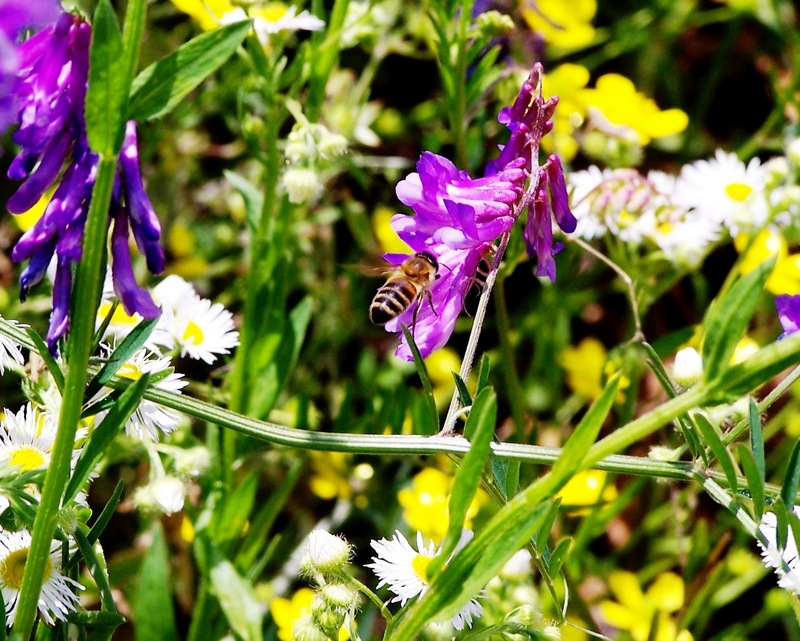 The purpose of the change from mowing roadside grasses to tending meadows is to support honey bees and native pollinators by providing forage, habitat, and nesting areas. Issues brought up include motorists’ safety, the value of increasing plant and pollinator diversity, the benefit to pollinators by increasing forage and nesting places, mowing cost reductions, herbicide and pesticide reductions, invasive species control, prevention of soil erosion, and landscape beautification. One gracious writer said, “That makes perfect sense from a naturalist’s point of view; the energy savings from a conservationist’s point of view; the dollar savings from an economist’s point of view; the carbon savings from the environmentalist’s point of view and the tax savings from the taxpayer’s point of view. Don’t expect it to catch on in Nashville.” Sure, changes in public policy and procedure don’t come about easily. However, I do believe that there is growing interest in the need to protect the pollinators, increase biodiversity, conserve our resources, and protect the environment. 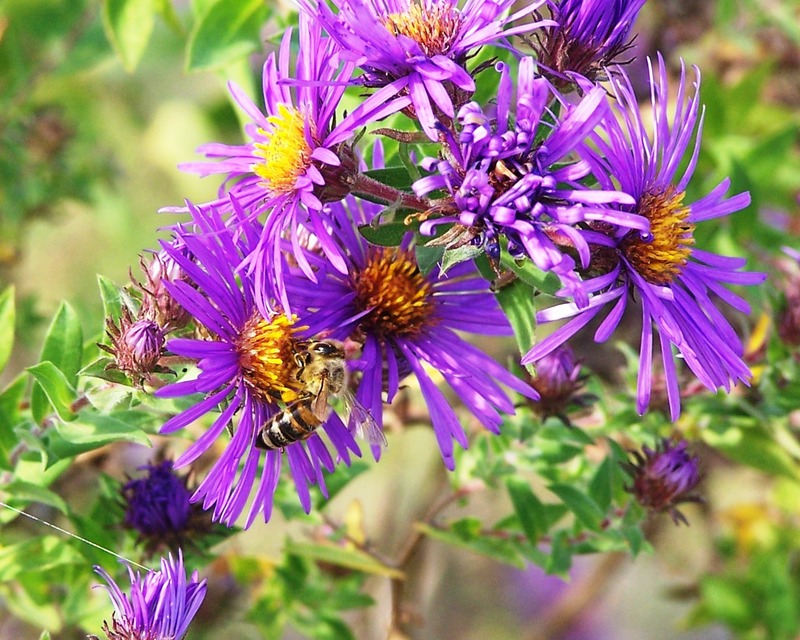 Pollinator plantings are being employed in a number of states. The environmental and management concepts are well developed, and successful pollinator plantings are established. We should see more pollinator pastures along the highways; and, eventually, they will be connected into corridors connecting diverse habitats. 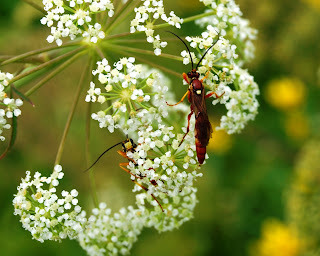 Today’s photo shows small red wasps pollinating wildflowers in Colorado. On a recent visit, I found abundant, diverse wildflowers along the roadsides. The blooms attracted many species of wasps and solitary bees. I found no honey bees at this high altitude. I thank all who have entered into the discussion of how we can help our bees and native pollinators. Eventually, pollinator corridors will catch on in Nashville. “Some electrical power and petroleum pipeline rights-of-way are being maintained according to designed integrated plant management plans. Here, appropriate native grasses and wildflowers are allowed to grow in unmowed prairie habitats. Native wildflower species are chosen to provide continuous blooming throughout the growing seasons, and native shrubs are allowed to line the margins of rights-of-way. “The resulting prairie affords vehicle entry into the rights-of-way while providing important habitat and forage for honey bees and native pollinators, songbirds, and small mammals. The honey bees and native pollinators, important for the production of one-third of our human diet, are declining in numbers across North America. The Xerces Society for Invertebrate Conservation has prepared an overview of the conservation potential of roadside habitat. It may be viewed at http://www.xerces.org/pollinator-conservation-roadsides/. Just at bison and large mammals benefit from established wildlife corridors in the American West, honey bees and butterflies can benefit from pollinator corridors along our interstate highways. Today’s photo shows a honey bee foraging vetch among asters and buttercups. The actions that beekeepers take as they work in the hives often affect the colony for months into the future. An early fall hive inspection alerts us to actions that need to be taken to ensure that the bees will be able to care for the brood next spring. I assisted Shirley Murphy inspect her Tennessee River bee hives. We found healthy colonies with queens still laying some eggs, but at a lesser rate than earlier in the year. It’s a good sign to find egg laying activity in October. Worker bees that emerge in the fall have a different physiology from the bees of spring and summer. Bees emerging in the fall can live for six months, and they will be capable of producing the brood food for the next year’s first brood. 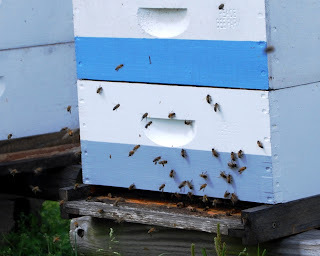 The older bees in the hive now are summer bees that will not live through the winter. Spring and summer bees have a shorter life of about six weeks. Mike Worthy identified the queen bees, and we made slight realignments of frames to place the brood nest low in the hive with frames of honey above the brood. Since the workers were still feeding larvae, we made sure there was a frame of pollen on either side of the brood nest. Nurse bees feeding larvae like to have pollen close at hand. With a drought limiting fall nectar production, we identified hives light in honey stores so that they could be given a supplemental feeding. Bees fed sugar syrup now have enough time to convert it into honey before winter arrives. Another visit to Agnes Stark’s Arlington, Tennessee bee hives found large populations of bees with egg laying activity in progress as well. The longer that queens lay eggs in the fall, the more workers there will be to feed the colony’s brood in the late winter and early spring. In each bee yard we found few drones; most had been ejected from the hives. The world that you and me and the honey bees live in is being sprayed, coated, and drenched with chemicals. Agricultural fields, lawns, and golf courses are treated with chemical fertilizers, herbicides, and pesticides to produce larger crops, and greener, weed-free grass. The visible effects of this level of chemical use can be measured in more food crop yield per acre of farmland, less fuel consumed tilling the soil, crops available for conversion into alcohol for fuel, and greener lawns and golf courses. Some of the less visible effects of today’s chemical use include weeds becoming resistant to herbicides; pests becoming resistant to insecticides, miticides, and other pesticides; water quality affected by chemical run-offs; soil damaged by persistent chemicals; increased monoculture farming; the loss of pollinator forage and habitat; and the compromising of honey bee immune systems. While the recent report of one scientific study of honey bee health pointed to a lethal combination of Nosema disease and Invertebrate Iridescent Virus, beekeepers who have been following the CCD investigation are asking questions about the findings. Particularly troubling to some is the lack of mention of certain insecticides that have been suspected of damaging the honey bees’ immune systems. Many beekeepers in Europe and North America feel that the neonicotinoids, like Imidacloprid, have not been proven to be safe for honey bees. To add to the lack of trust among beekeepers, some are questioning the conflict of interest between researchers and chemical companies. For example, see http://money.cnn.com/2010/10/08/news/honey_bees_ny_times.fortune/index.htm. Regardless, any scientific investigation must be able to stand up to scrutiny. Confidence in tests is built by repeating the tests and increasing the number of samples taken. The association between Nosema disease and IIV Virus in collapsing honey bee colonies needs further study. The connection between sub-lethal exposure levels of Imidacloprid and honey bees’ immune systems certainly needs independent study. 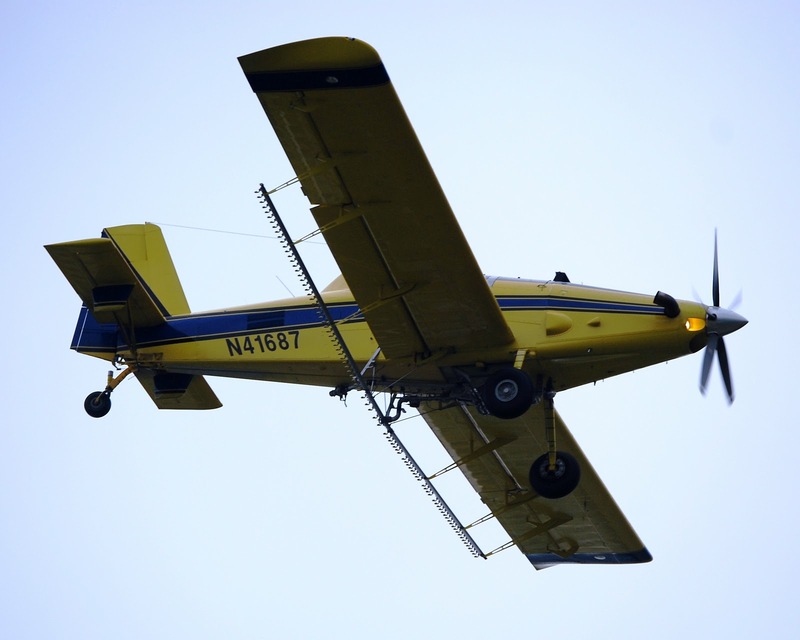 Today’s photo: An aerial applicator sprays insecticides to kill soybean loopers. Insecticides and fungicides are questioned as having weakened honey bees. This week’s publication of findings in the study of Colony Collapse Disorder provides beekeepers encouragement that we are closer to having an understanding of the pathogens that are associated with the disorder. With this knowledge, we now want to know if CCD will become a controllable disorder, like so many of the conditions that beekeepers regularly face in managing their colonies. Beekeepers want to know what things they need to do to help maintain healthy colonies. It is remarkable how resilient the honey bee has proven to be. It has survived for millions of years under changing environments and in the presence of myriad pests and pathogens. This survival illustrates the strength and importance of natural selection. Only those honey bees that held the traits that allowed their survival and reproduction in the face of current environmental conditions were able to pass along their genes to another generation. Often for the survivor it is the chance result of being in the right place with the right trait at the right time. The trait may be a natural resistance to a particular pathogen. CCD has taken a large toll on honey bees. Annual losses of colonies in North America are one in three. Recent years have found a number of pests and pathogens entering the US, most brought in unintentionally through expanding world trade: tracheal mites, Varroa mites, small hive beetles, Nosema ceranae, and a number of viruses. This week’s CCD report also listed two viruses, previously unknown, as now existing in the US. 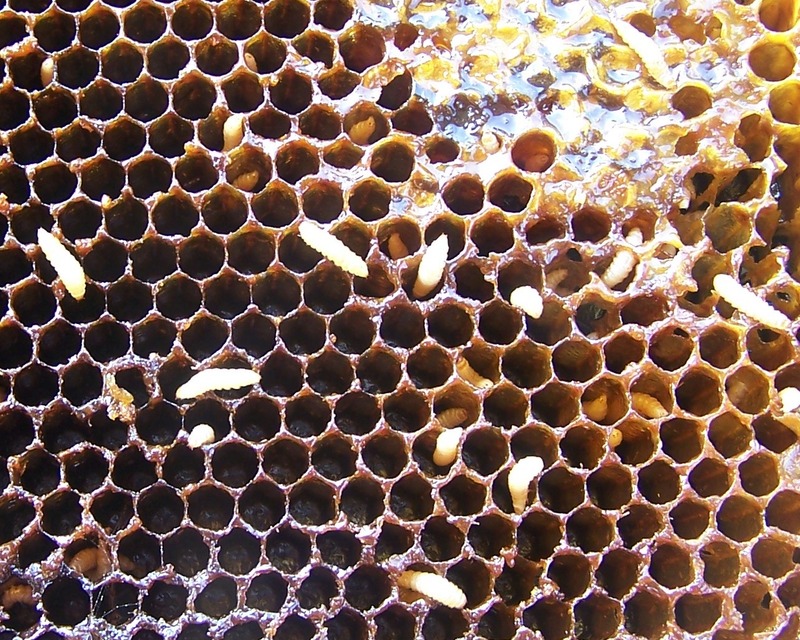 How will beekeepers adjust their hive management with the new understanding of a relationship between Nosema and Invertebrate Iridescent Virus? The larger question is: Will a line of survivor honey bees emerge that are resistant to CCD? There is reason to believe so. When tracheal mites arrived in the US in 1984 they decimated colonies. Now after a few hundred brood cycles, the parasite is much less lethal. 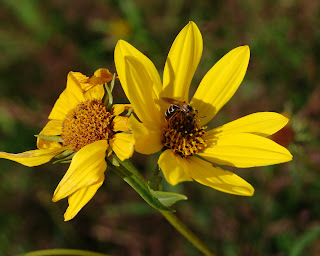 Today’s photo: native leaf-cutting bee on perennial sunflower. Well, we finally have a published report of the current findings in the study of the causes of Colony Collapse Disorder. The report is available online at http://www.plosone.org/article/info:doi/10.1371/journal.pone.0013181. I gave it a quick reading; I’ll give it a much more thorough view. The CCD study is definitely not over. We don’t necessarily know the cause, but a strong association between the collapsed honey bee colonies and two pathogens has been established. In the near future we will be hearing much about strains of DNA Invertebrate Iridescent Viruses. We will speak freely about IIV. Nosema disease will be brought further to the front of discussion. 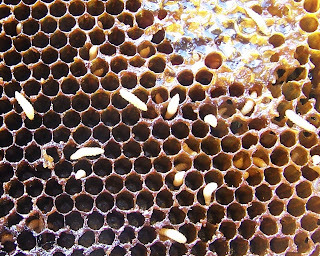 Nosema apis was around throughout beekeeping, but it was usually considered an easily controlled over-winter ailment. Nosema ceranae was only discovered to exist in the US after the CCD investigation opened up a search into all possible pathogens affecting honey bees. It was revealed that the new strain of Nosema was not only in the US before the 2006 CCD outbreak, it had replaced the original strain in many cases. Many questions remain unanswered. What is the involvement of the numerous viruses that infect honey bees? Do environmental chemicals and pesticides play a role in CCD? How do problems associated with poor nutrition and other stressors affect CCD? How are honey bees’ immune systems affected by the recently identified IIV Virus and Nosema combination? Can we rule out any of the items that have been suspected as being involved in CCD? Further studies involving greater numbers of samples will increase our knowledge of this complex honey bee health disorder. Meanwhile, we need to thank all who worked to get us to this level of understanding. The professional researchers adhered to disciplines to ensure the validity of their studies. Beekeepers gathered samples of honey bees and comb to provide a measure of parasitic Varroa mites, pathogens, and honeycomb chemicals. The media effectively kept the story in the public’s forefront. Today’s photo: honey bee pollination’s gift, Washington peppers. There have been die-offs of honey bee colonies periodically reported for many years. The most severe of all such events in the United States started in the fall of 2006 when migratory beekeepers discovered large numbers of their hives mysteriously depleted of honey bees. By the spring of 2007, similar massive losses of honey bees were being detected in numerous locations across the country. As the losses of honey bee colonies rapidly increased, it became apparent that this die-off of honey bees involved certain characteristics that were not common with previously known honey bee diseases. The condition was given the name Colony Collapse Disorder, and a number of carefully planned studies were initiated to identify the causes of the disappearance of the honey bees. While beekeepers were experiencing costly losses of their colonies, many realized that a quick resolution of the problem was not likely. With many hive variables, it would take time to analyze the condition of hives across the country. Different hives are used for different purposes; they are exposed to a variety of pests and parasites; they have different nutritional resources; they are exposed to a wide variety of environmental chemicals inside and outside the hive; and they are managed differently by individual beekeepers. Over the past four years, preliminary findings eliminated a number of possible causes of CCD and placed others into focus. Now, a report of the likely cause of CCD has been published. News of the report can be read in today’s New York Times at http://www.nytimes.com/2010/10/07/science/07bees.html?_r=1&src=me&ref=homepage. The researchers found that when a particular honey bee virus is paired with Nosema disease, the combination is almost always lethal. The full report, “Iridovirus and Microsporidian Linked to Honey Bee Colony Decline,” has been published online, and may be viewed at http://www.plosone.org/article/info:doi/10.1371/journal.pone.0013181. 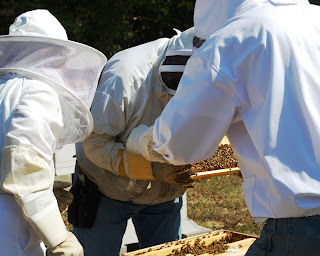 Peace Bee Farm has been involved in collecting bee and hive samples for several of the CCD studies. 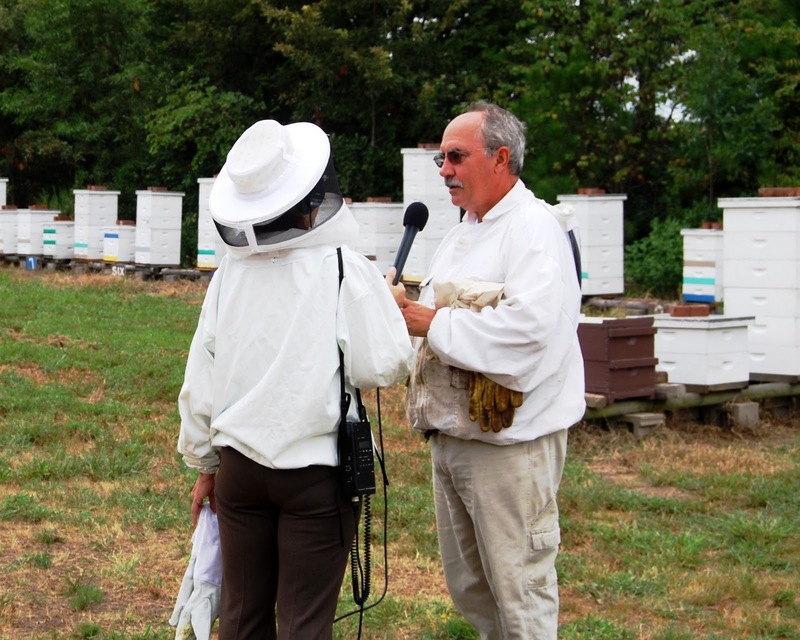 NPR of the Mid-South news director Candice Ludlow interviews me during a recent sampling. The honey bee is our most important crop pollinator. The honey bee accomplishes about 85 percent of the pollination of our flowering plants. The remaining 15 percent of the work is done by many species of native bees, bumblebees, butterflies, moths, birds, bats, and various other insects. In the absence of these pollinators, humans can move grains of pollen from the anther of one flower to the stigma of a similar flower on another plant. Bees pollinate about 90 of our food crops, one third of our diet. If pollination is not accomplished, there is no fruit or seed produced. However, this is usually not the case in nature. Even where there is a shortage of bees, some flowers are visited. The result of insufficient numbers of bee visits is often seen in misshapen fruit. Cucumbers, watermelons, and pumpkins only fill out in nice, plump shapes when the flowers are visited by plenty of bees. Rita and I made a visit to the state of Washington to see Wes. 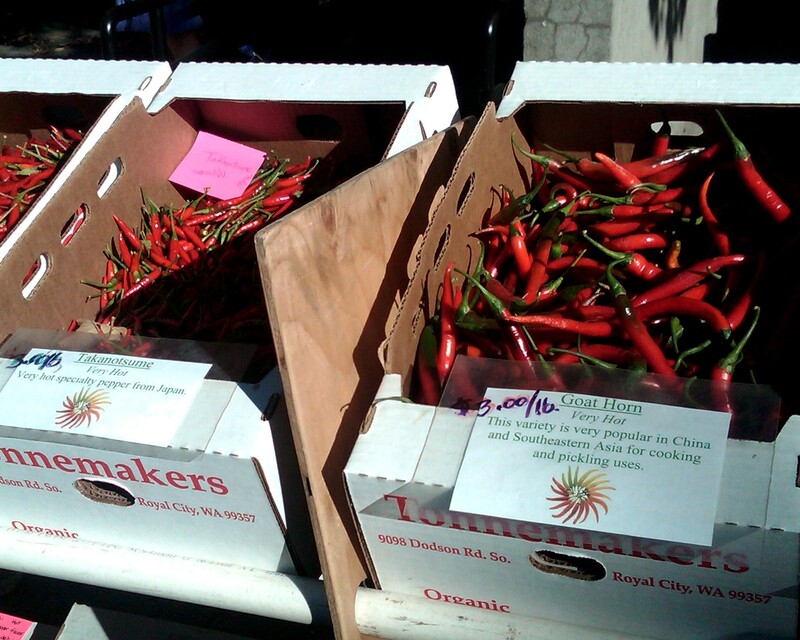 The three of us visited the farmers market at Moscow, Idaho. Like farmers markets across the country, the Moscow market was quite popular on a Saturday morning. 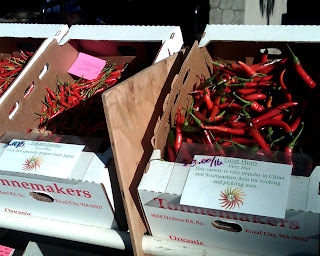 People gathered to buy fresh farm produce, meet the farmers, and enjoy a sense of community with friends. We found beautiful, fully developed fruit and vegetables from the rich farmland of Washington and Idaho. 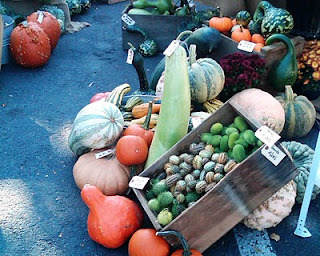 There were colorful and fragrant apples, pears, and plums as well as bright pumpkins, tomatoes, squash, gourds, and peppers. At the market, we visited with some Washington beekeepers who have a family farm that transports bees for pollination service from California through Oregon and Washington. After trucking their bees for pollination, they bring them home to strengthen the hives on fields of canola. We purchased some of their light and mild knapweed, or star thistle, honey. We also bought some of their buckwheat honey, black and strong with an aftertaste, a honey enjoyed by only a select few.